Sometimes, delays can lead to blessings. A small incident today illustrated that for me when I rediscovered Zach Vinson’s music. I got up extra early so I could get a good spot at the 6 a.m. yoga class at the David D. Hunting YMCA. (I always call it that on first reference. ;) ) The Tuesday/Thursday morning instructor likes to set up the class horizontally, which has the unfortunate side effect of making latecomers, or even just on-time folks, have to set up their mats in the “front row,” while everyone who got there earlier gets the “good spots” with their backs facing the studio mirror. My goal was to arrive early enough for a “good spot,” but I was delayed. Before pulling out of the garage this morning, I put my Y membership card on top of the armrest between the front seats in my car, thinking my elbow would keep it in place. Wrong. A badly placed construction barrel forced me into a sudden sharp turn, and the card went sliding into the belly of the abyss, that too-skinny slot between the foundation of the armrest and the track of the driver’s seat. “Great,” I thought. “Now when I get to the Y, I’m going to have to spend 10 minutes digging the card out of the abyss instead of getting my ‘good spot’ in the East Studio. And everyone will stare at me while I awkwardly set up my mat in the ‘front row’ and disrupt everyone’s on-their-way-to-being peaceful vibes.” Yadda, yadda. 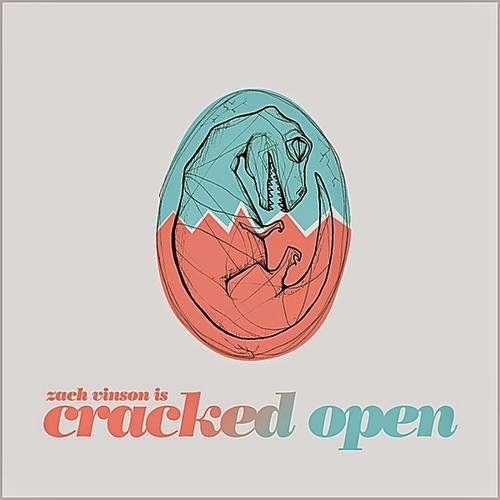 Zach Vinson’s “Cracked Open.” I’m going to assume few people reading this will have heard Zach’s music, unless you went to CU or were lucky enough to discover him in the years since he moved to Nashville. Consider this an introduction. Zach is a multi-instrumentalist singer-songwriter who calls his music piano rock. It’s hard to say which half is stronger: his musical performance or his songwriting skills. I still can’t decide, even after knowing him personally for two years in college -- during which time I heard several live performances of original songs -- then listening to his music sporadically throughout the five years since. If you talk to Zach, or read his lyrics, you’ll experience a relatable blend of reserve and self-deprecating wit, which then are mixed with some truly deep insights about himself and the world around him. Maybe I say this because, as a writer and an introvert myself, I relate strongly to the things Zach writes about, but my hunch is it’s more than that. In only his second album, he already was describing the human condition, with all its warts and foibles, but also with its beauty and grace. I don’t come across many songwriters who are doing that – writing from the heart, having the guts to point out facts about humanity that often are ugly. And then in the next verse, he turns to the beauty and also points to that. After rediscovering Zach's music today, I realized something. It's perfect for people who are late for yoga.